Be ready; it may happen soon. 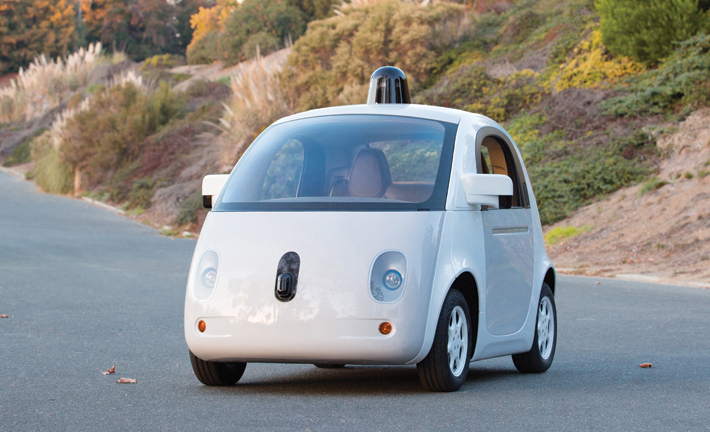 Self-driving cars will have a number of social and economic effects. In addition to freeing drivers to engage in tasks other than driving, autonomous vehicles promise to reduce traffic collisions by removing humans, and thus human error and negligence, from behind the wheel. By allowing closer platooning and lowering the number of collisions, self-driving vehicles will also increase effective road capacity, particularly on highways. Since the initially steep upfront costs of driverless vehicles can be offset by lower labor costs, the freight, transit, and taxi industries could be early adopters of driverless technologies, affecting the country's 4.5 million bus, taxi, and truck drivers — mostly men with high school degrees or less, a demographic that has not fared well in the recent recession or the larger digital revolution. Self-driving cars also could have profound, though highly uncertain, impacts on sustainability and urban form, two areas of particular interest to city and regional planners. Whether self-driving cars reduce harmful emissions or the amount of land, energy, money, and other resources consumed by the transportation system depends largely on whether they reduce car ownership and driving. Optimists envision a future where driverless cars lead to a revolution in shared urban mobility. Why own a car when you can summon one to pick you up while avoiding the worries of parking, insurance, or maintenance? In this scenario, the shift in ownership will also encourage payment based on miles driven and time of day rather than lumpy vehicle purchases, insurance fees, and parking. Instead of thinking about how much gas is in the tank, travelers will now consider the full marginal cost of a car trip when deciding whether to walk, bike, drive, or take transit. Transit service may also improve as a result of shared cars and minivans operating on fixed and flexible routes. The biggest opportunity for improvement is in cities and neighborhoods where densities are currently too low to justify frequent bus or rail service. If shared or public, self-driving cars will dramatically reduce the demand for parking. Even privately owned vehicles will drop off passengers at front doors before driving off-site or behind a building to park, thus decoupling parking from other urban land uses. This would allow cities to dedicate more space to housing, shops, and offices, as well as stormwater management, street trees, and other sustainable features. Pessimists, by contrast, see vehicle automation as one more technology that makes driving more comfortable and convenient and thus increases the amount that people drive. In this scenario, most households will own one or more self-driving cars, send their vehicles to run errands, circle to avoid paying for parking, and treat travel as if it had zero or very low time costs. Many cars may become full-time mobile offices, whisking people between meetings, and the number of workers commuting between metropolitan regions will almost certainly increase. Making long commutes more productive will support the growing trend in long-duration commutes. Between 1990 and 2010, the proportion of commuters traveling more than 60 minutes and more than 90 minutes to work increased from six to eight percent and 1.6 to 2.5 percent, respectively. Self-driving cars will also expand personal mobility for the third of the population without drivers' licenses and the tenth of households without cars due to age, disability, low income, or preference. A demonstration video of one of Google's prototype self-driving cars features a legally blind man riding to a Taco Bell in a self-driving vehicle. Expanded access to cars may be particularly important for the nation's elderly, many of whom live in and would like to remain in car-dependent communities. In this scenario, even if self-driving cars double existing capacity, this capacity will fill quickly — encouraging dispersed development and greater land consumption, which would further erode any sustainability benefits from increased efficiency. Whose view is more realistic — the optimists' or the pessimists'? Both may be partially correct. Net effects will vary across states, cities, and neighborhoods. In dense urban areas with good transit where the demand for space and shared mobility is higher, driverless cars will tend to increase density and improve transit. In sprawling areas, self-driving cars will encourage more sprawl by making it easier to live farther from employment centers and other destinations. Urban cores will likely concentrate while peripheral areas expand. Suburban areas will probably continue to rely on privately owned vehicles but could see improvements in transit and shared mobility. What can planners do to prepare for driverless vehicles? The new technology could produce rapid and radical changes to metropolitan transportation systems, particularly freight and transit. However, the timing, scale, and direction of the impacts are uncertain and the opportunities to influence outcomes are limited. For better or worse, major changes to passenger travel might be slow to materialize — the technology remains expensive and the vehicle fleet turns over slowly (the average passenger car is just over 11 years old). Some 15 years after the commercial release of the Toyota Prius, hybrid vehicles make up only a tiny share of the U.S. car fleet. Regardless, planners should pay close attention to the technology, start thinking about which regulations (particularly on-site parking requirements) could change quickly in response to new technologies, and perhaps redirect capital investments away from infrastructure-heavy projects with a long lifespan to shorter term, more flexible projects that are insulated from some of the uncertainty around the timing and impacts of self-driving cars. Erick Guerra is an assistant professor of city and regional planning at the University of Pennsylvania, where his research focuses on the relationships between transportation infrastructure, land use, urban development, and travel behavior. Read "Attention: The Age of Automation Is Right Ahead," an expanded version of the article that appeared in the printed magazine. Image: This early prototype of Google's self-driving car was designed to go from point A to point B without human intervention. Riders push a button to start, pull over, or to stop in an emergency. This test model has a maximum speed of 25 mph. Courtesy Google.